Aoraki Bound is proud to be have a strong relationship with Genesis Energy. By supporting Aoraki Bound Genesis Energy are embedding their relationship with Ngāi Tahu at a deeper level than just a corporate relationship. There is a clear intent on all parties for the relationship to be mutually beneficial, enriching and enlightening of our respective values. At a signing ceremony in December 2017, Genesis Energy confirmed their support for Aoraki Bound, offering $32,000 towards the kaupapa for three years. 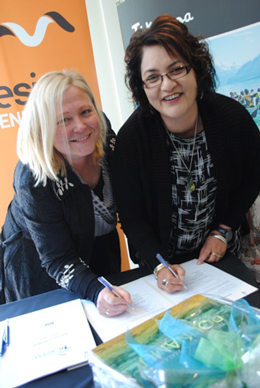 The signing – by Te Rūnanga o Ngāi Tahu CEO Arihia Bennett and Genesis CEO Marc England – ensures Aoraki Bound continues to provide future Māori leaders with a unique experience, at the same time facilitating greater cultural understanding and respect. Genesis Energy General Manager, Tracey Hickman, with Ngāi Tahu Kaiwhakahaere Tuarua Lisa Tumahai. Ngāi Tahu Kaiwhakahaere Lisa Tumahai says the commitment from Genesis Energy is critical to support the continuation of this important development programme. Aoraki Bound had provided both Māori and non-Māori with the chance to walk in the footsteps of Ngāi Tahu ancestors and learn the history of Te Waipounamu. The course plays an important role in reflecting and meeting the needs of New Zealand’s rich tapestry of ethnic diversity. Genesis Energy General Manager, Tracey Hickman says that the concepts that lie at the heart of the Aoraki Bound are reflected in the company’s community investment strategy. Aoraki Bound is the result of a partnership between two values-based organisations; Te Rūnanga o Ngāi Tahu and Outward Bound. Both organisations have similar values and genuine track records in building capacity in people, culture and communities. Ngāi Tahu wished to work in partnership with Outward Bound to develop the programme by accessing Outward Bounds expertise in the field of experiential education using the outdoors as the medium to achieve the objectives that they have set for the Aoraki Bound programme. Outward Bound for its part, sees this partnership with Ngāi Tahu as assisting it towards the achievement of its vision of helping to develop “Better people, Better communities and a Better world” and to assist Outward Bound in its further objective of making Outward Bound relevant to all sectors of New Zealand society. Aoraki Bound is a first in New Zealand, combining the proven methodology of Outward Bound with the cultural knowledge and aspirations of Ngāi Tahu in developing a course not only for Ngāi Tahu, but for all New Zealanders. The course will be a doorway to Ngāi Tahu culture, tikanga (traditions), mahinga kai (food gathering) and reo (language) supported on an Outward Bound framework of personal and social development through values-based experiential learning in an outdoor environment. The course is designed to reinforce participants Ngāi Tahu identity and offer all cultures, communities, organisations and individuals a better understanding of and comfort with Māori culture. He karahipi tēnei hai whakamihi, hai whakanui, hai whakamahara i a Tā Robert Te Kotahi Mahuta, i te rua tekau tau o te hainataka o te kerēme Raupatu Whenua o Waikato-Tainui. This scholarship is to acknowledge and celebrate the memory of the late Sir Robert Te Kotahi Mahuta and the Waikato-Tainui Raupatu Lands Settlement 20 year commemorations. Every year, the scholarship gifts one Waikato-Tainui tribal member a place in the the Aoraki Bound hīkoi. E matua whakapono ana a Kāi Tahu ki te honoka ki a Waikato-Tainui. Ko te manako nui ia, ka ora ā tātou rakatahi i tēnei honoka kia eke panuku, kia eke takaroa. Mā te karahipi nei ka rauhī te whakapūmautaka i waeka i a Kāi Tahu me Waikato-Tainui kia hono tahi ai, kia whakatītina ai te mōhiohio. Ngāi Tahu recognizes and values our relationship with Waikato-Tainui. The vision is that this relationship will be strong and will flourish in the future, nurtured by successive generations of young tribal leaders. It is our hope that this scholarship will help foster this on-going commitment between Waikato-Tainui and Ngāi Tahu to help build connection, foster shared understanding and knowledge. Te Rūnanga o Ngāti Waewae, Māwhera Inc.